Seventh full-page illustration for Dickens's Little Dorrit in the James R. Osgood (Boston), 1871, Diamond Edition. 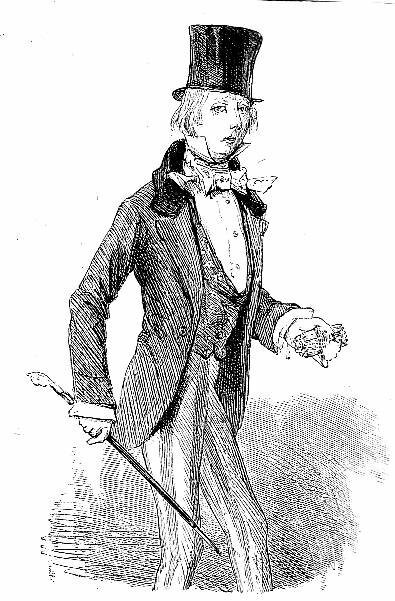 "Young John Chivery," the seventh full-page illustration, facing page 124 of the Diamond Edition, by Sol Eytinge, Jr., in Charles Dickens's Little Dorrit (Boston: James R. Osgood [formerly, Ticknor and Fields], 1871). If Young John had ever slackened in his truth in the less penetrable days of his boyhood, when youth is prone to wear its boots unlaced and is happily unconscious of digestive organs, he had soon strung it up again and screwed it tight. At nineteen, his hand had inscribed in chalk on that part of the wall which fronted her lodgings, on the occasion of her birthday, "Welcome sweet nursling of the Fairies!" At twenty-three, the same hand falteringly presented cigars on Sundays to the Father of the Marshalsea, and Father of the queen of his soul. Dickens, Charles. Little Dorrit, il. Sol Eytinge, Junior. The Diamond Edition. Boston: James R. Osgood, 1871.